ARITA ceo John Winter: warned insolvency practitioners face many challenges from ILRA "dog". IMF Bentham’s Clive Bowman: kicking off ARITA NSW/ACT conference. With the CPA Australia acid bath showing no signs of dilution – despite the resignations of seven directors in two weeks – nobody should’ve been surprised when John Winter revealed yesterday that the board of the Australian Restructuring, Insolvency and Turnaround Association (ARITA) had been busy plotting a course to a new standard of replenishment and renewal. 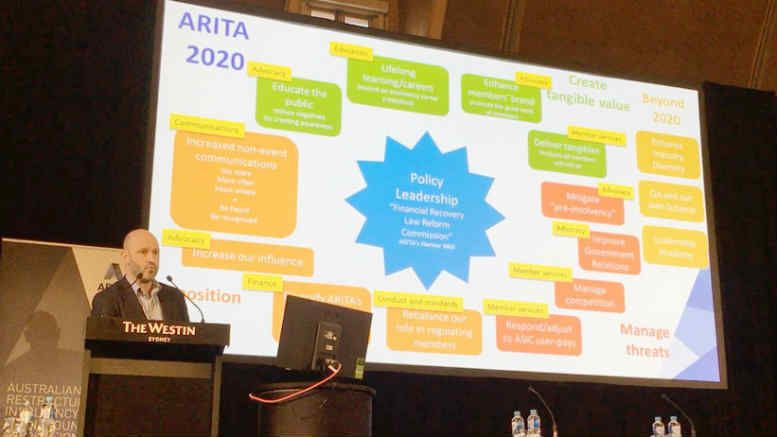 Addressing attendees at ARITA’s NSW/ACT divisional conference, the ARITA chief executive said current board members had taken “tough decisions” in regards to their own “longevity”, and promised members that discussion papers on the topic would be circulated shortly. Unlike the beleaguered CPA Australia, ARITA’s board, like almost every other professional association in fact, isn’t remunerated. Nor does it appear to be acquiescent and in thrall to a despotic CEO. Maybe that’s why what complaining you will hear involves the difficulty of getting on it. The directors give their time for expenses only and according to the 2016 annual report, Winter shares $873,000 with five other ARITA staff members. Lee White over at Chartered Accountants Australia & New Zealand (CAANZ) could buy the lot with his take home. That doesn’t mean ARITA’s free from criticism. Grumblings aplenty emanates from some quarters. There’s too many lawyers, too many big-end-of-town influences, it’s too profitable. Sometimes you’d swear they’re angling for a capital return. One well known lawyer told SiN there was a groundswell of discontent around how ARITA is being managed. He said many felt it wasn’t “member friendly”. The handling of disciplinary matters seems to be a key issue. The lawyer, who said he spoke for at least 40 members, said practitioners feel they’re already on the rack with ASIC on its compliance jihad and wonder why their member organisation has to be so pedantic. SiN was also told some were dissatisfied with the voting processes accompanying the recent elections which perchance saw Ashurst restructuring partner Ross McClymont appointed as ARITA’s first lawyer President. In his year in review address, Winter pulled no punches while outlining the challenges ahead. He reiterated ARITA’s view – outlined in its most recent submission to ASIC on the user pays funding model – that within 18 months of implementation 200 registered liquidators would relinquish their tickets, massively increasing the financial burden on those who remain. The Insolvency Law Reform Act (ILRA) meanwhile was “an absolute dog” of a piece of legislation and in terms of compliance burdens, delegates should not to expect much latitude from ASIC. Even the $150,000 ARITA spent representing the profession’s position in the Court of Appeal on the Sakr Nominees remuneration case didn’t buy much joy. Winter said the Court of Appeal decision wound the clock back a few years on the ad valorem-inspired decisions of NSW Supreme Court Justice Paul Brereton but warned that the genie was out of the bottle. 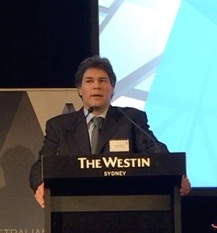 Looking ahead Winter said the profession needed to be on its toes in relation to the ongoing calls for a Royal Commission into the banking sector, telling delegates it was probably “one small crisis away” from becoming reality. The spectre of what could flow from hordes of unregulated restructuring advisors providing bogus safe harbour advice did not need to be invoked. He also warned that the pre-insolvency advice sector continued to elude the legislator’s grasp and was aggressively growing and modifying its business models and that going forward, the profession needed to soften the public perception around insolvency and establish a broader message of “financial recovery”. And in news likely to interest his small practice and sole practitioner constituency, Winter announced that ARITA would shortly begin drafting precedent documents, revealing that the association had already begun preliminary talks with one of the insolvency practice software providers. 2 Comments on "ARITA board no CPA clone when it comes to renewal"
Keen to hear more from ARITA regarding the resourcing of the precident and check lists which are complinent to the law reform. Start date 1st September 2017. Some thing members had been asking about for some time. Good to hear ARITA is there for the small firms that are still in the displined space noting that not all members will ever need to be diciplied! I got out 3 years ago when badgered by ASIC about my DIRRI on a group with no assets until the ATO stuffed up and sent me a couple of hundred thousand. They were all over me about independence which ultimately turned out to be a waste of time as there were no conflict of interests. So a sole practitioner of some 30 odd years standing I left the industry. The loss to the industry was more profound in that I provided a service to the bottom end of town that the big boys did not service. I gave the autopsy opinion to directors, shareholders, ASIC, employees and creditors over the corporate corpse which allowed them to close the book and move on. In the current environment that cannot happen. I gave up on ARITA when one of my peers fleeced a liquidation that he took over from me after the failure of the DOCA due to the GFC. I complained to ARITA and ASIC but they had no interest in a small claim, they wanted to hit the headlines and mine would not achieve that result for them. How much did HIH cost the ASIC and what a spectacular failure was that result. I can’t quote the statistics off hand, but my understanding is that small business makes up a huge portion of the Australian economy, yet ASIC and ARITA are only interested in the big end of town. My proposition is that if you funded and supported the lower end of town you could educate those directors who have trade and sales skills but no governance skills. You could support those insolvency administrators who call out the unscrupulous directors who swim in our pond and prosecute them so that the other fish in our pond recognise that it is not a good thing to breach the law. The big end of town will employ the top end of town solicitors to avoid their legal consequences at great expense to the public purse and the opportunity to discourage poor, bad and illegal behaviour by directors across the breadth of the economy will continue to be lost.